Al Lamb’s Dallas Honda -- It was another night of glory for GEICO Honda Team and especially for Eli Tomac. The rider triumphed after a tricky start to 2015 season with two crashes in the main event. Eli Tomac who had to take the checkered flag at 20th spot in series opener went on to show his true reckoning at round two Phoenix Supercross held in Arizona. GEICO Honda rider’s spectacular performance more than made up for the lackluster finish of his two teammates Cole Seely and Trey Canard despite top notch performance anticipated from them by all. The squad however, managed to maintain the spotlight position with Tomac’s magnificent ride making him the fastest rider in the qualifying rounds. Eli Tomac made his debut premium victory riding a factory CRF450R similar to Seely and Canard. Canard’s ride for the evening began with a hiccup which ultimately cost him in completing a top finish. Yet the talented rider consolidated his standing as a top contender challenging a powerful roundup of peer talent and crossing the checkered flag to grab an intimidating eight place. Seely’s bad luck from the main event followed him to round two. A few glitches and bumps along the way put him in a subdued fourteenth position behind than ultimately hoped for. Encouragement prevailed with a silver lining for Seely who had a career first win in the 450 heat race held earlier on the same day. Just before the race both Cole Seely and Trey Canard of Team Honda made an autograph signing appearance at Phoenix Dealership, Ride Now Powersports. The duo will make a similar appearance on January 16th at Huntington Beach Honda at 6 pm. Also expected to join the two riders are Malcolm Stewart and Matt Bisceglia stalwart riders of GEICO Honda Team. The race day also saw Rich Simmons mechanic of Seely and Biran Kranz mechanic of star rider Eli Tomac of Honda meeting with a large gathering of students representing Phoenix campus Motorcycle Mechanics Institute. The mechanics are both graduate technicians of the institute program and were enthusiastic about their opportunity of meeting with these students and providing them with insights to the life of a factory mechanic. Canard accomplished sixth fastest qualifying time with a 55.457 second record at the daytime program finishing just a hair breath off top man Eli Tomac’s mark. Seely finished at 10th pace with 55.891 a record just four tenths of a second after Canard. The lead was taken by Seely in the first heat race with him continuing to dominate the entire race from start to finish. 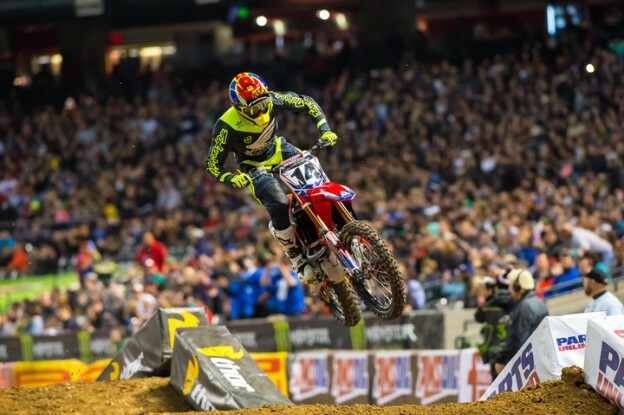 Tomac buoyed Team Honda’s spirits by topping heat two. Thus Honda team mates won both heat races as well as the ultimate main event for the day at Phoenix. The difference between win times in six lap heat races at .173 seconds was infinitesimal. The three riders on factory CRF450R all qualified direct to the main event with Canard finishing up fourth in first heat. Before the main event mechanics of Team Honda enhanced performance quality of CRF450R race bikes by fixing road race type tire warmers on the rear Dunlops. Dan Betley, Team Manager explained this move saying this is a technique used in some races to get a smooth heat cycle from the tires before race begins. ‘Even though tires can cool off by the time race actually starts the heat cycle help slightly change compound helping with traction’ he further explained. While the live television coverage was on Fox Sports 1 interchanged into a mini-feature dubbed ‘Passion to Persevere – and Trey Canard on Balanced Life’. This was a highly charged and emotional piece with centre stage set at Canard’s home in Oklahoma. The feature included shots of the rider during off-season with coverage on his faith, convalescing from injuries as well as the touching story of how he met his wife Hannah during a mission in the wilderness Africa. The next lap takes place at Angel Stadium of Anaheim as Team Honda campaigns second of three AMA SuperCross 2015 rounds on January 17. It’s always easy to spot the semi trucks of GEICO Honda and Team Honda in the pits of AMA Supercross. They are parked next to one another. It is not just for the view but also for practicality. Eli Tomac’s mechanic works out of the semi truck of Team Honda. All three riders Tomac, Canard and Seely receive same technical backing and support from HRC. With birds of a feather flocking together the spirits are always high. This was aptly displayed by the sharing of glory of Tomac’s first premier class victory within the entire Honda pit area. Dan Betley, Team Honda Manager commented on the unity of his team saying ‘I am really happy with communication of all three riders at this point’. He also mentioned that all three riders get together to watch films and share information on track lines. ‘I couldn’t be happier with their camaraderie, among both staff and riders. With everybody helping each other it is great. Yes Trey and Cole were bummed for their Phoenix results but they are still happy to see that both equipment and staff are capable’ said Betley.